You know how you fall in love with a brand, and you just can't seem to put their stuff away? That is exactly how I feel with Vapid these days. Those creams were amazing and I want to use them with everything. As I was putting my polish from one corner of my desk to another away, I noticed how delightful two shades in particular looked together. So I threw something together as fast as I could. I took the tiniest bit of Dark Twisted Fantasies and dry brushed it randomly across my nail. 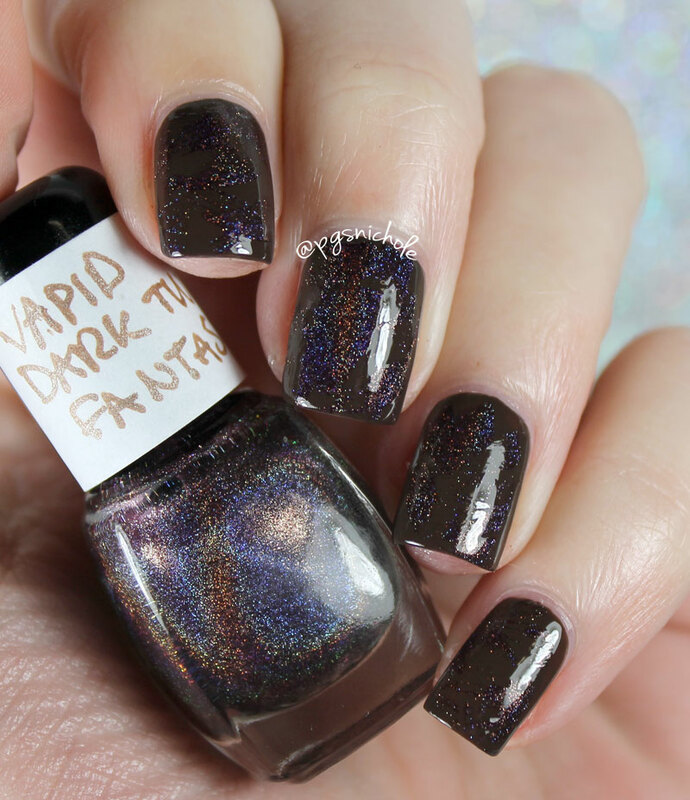 I love this deep brown and this glowing holo together! And dry brushing is so delightfully random that you really can throw it together in an instant. What do you think? Do holos work well for dry brushing or do you prefer contrasting creams? Oh I love this! Those colors go really well together! I really like this! The colors complement each other well. Wow. These two really do look beautiful together! This is an awesome combo. You can't even tell is dry brush! What a gorgeous combo! I love the end look too! Only you would consider this and of course.....KILLED IT! Oh man, that is gorgeous!! Great combo! What a clever idea! I love the effect, it gives a depth and a glow from within. Beautiful! This is beautiful! Loving that brown! I love dry brushing with holos and this is such a pretty combo!